Is it even possible to homeschool with toddlers? So, I’m going to write a post about how I homeschool with toddlers. Let me preface this post by saying that I do not do this job well on most days. I feel like a falling-apart mess usually. Why? I live in a house with two toddlers. My house is the very definition of chaos. I have lots of baby gates in my house. I move them all over – upstairs and downstairs. I gate different combinations of children in different rooms every 30 minutes during our homeschool days. This means that their destruction is confined to 1 room and I don’t have to worry about the rest of the house. It also means that I don’t have toddlers wandering into the homeschool room every 15 seconds to interrupt our school time. I have lots of canvas toy tubs that are each filled with different toys. Some hold foam blocks, marble run pieces, toy cars, Lincoln Logs, or dolls. When I gate children in a room I give them the choice of 1 tub. They can then dump that tub on the floor and play for their 30 minute time. When it’s time to move to a new area the clean up is quick and I can easily select a new tub with different toys. I rotate these toy tubs to keep the playtime interesting. The kids look forward to selecting their toy tub and playing during their gated play times. I write lesson plans for an individual time with both Punkin (age 1) and Ladybug (age 3). Every single day they get 30 minutes of uninterrupted time with me to do their “school” which consists of coloring, cutting, painting, glueing, and digging through sensory bins. After they’ve had their dedicated time with me, they are more willing to go play with a sibling and give me some time to work with someone else. But first, I make sure they each get their quality time during our school days. My toddlers do so much better when they know what to expect during our days. They know that their special time comes right after breakfast. Then they expect the play time before lunch. And after lunch they are ready for our reading time before rest time. Once we have an established routine our days run more smoothly and my toddlers are less cranky. Everyone appreciates knowing what to expect during our homeschool day. It takes me about a month to firmly establish our routine and I make sure that I talk them through the routine every day, reminding them what will be coming next so they can prepare for changes. I have one napping toddler and one non-napping toddler. Either way they both have some quiet rest time in their rooms. Little Punkin usually naps but Ladybug likes to listen to audiobooks while she plays with dolls in her bed. They both need these quiet times to recharge and be ready for the evening. I find them much more pleasant after they’ve each had their afternoon break and we can be very productive in our quiet house while the toddlers rest. While it would be amazing if I could use these quiet times for myself to rest, I make sure that our school books are close at hand and we dive right in. When the house is quiet we work together in a group to do our subjects such as Bible, history, science, geography, and Spanish. This is our time to learn together rather than individual learning time with me. While I’m getting the little girls ready for rest time, the older kids know what supplies to get ready and they are waiting for me in the homeschool room to get started. I also do school in the early morning before the two toddlers are even awake. This makes for very long days for me but the peace and quiet of sleeping toddlers makes the sacrifice worth it for me. Are you singing the song now? It runs through my head daily. It has nothing to do with that movie though. Nope, it’s my internal mantra. During my days of busyness I have to let something go. First, I get my priorities in check – Bible study, hubby, children, homeschool, food, house. Did you see what comes last? House. If you come over you’ll see exactly what “house” as the last priority means for me. It means that I try to close my eyes and embrace the clutter and mess. When you are homeschooling with toddlers there are just some things that you will have to let go. For me, it was a clean house. I’ve also had to let go of elaborate meals – opting for quick and easy meals that I prepared and put in the freezer. I’ve also been known to finish up some homeschooling in the evenings or on the weekends when time was not on my side for that week. Whatever this means for your homeschool, you have to find the areas in which you can let go. No, it is not easy to homeschool with toddlers. Some days you will spend more time reminding them to share or to use their inside voices. But I am living proof that it is possible to homeschool with toddlers. I daily remind myself that this is a short season of life and that one day those little toddlers will be sitting next to me writing an essay or doing division problems. Until then, I try to embrace the coloring pages, screaming, sensory tubs, and tantrums. Be encouraged homeschool mom! You can survive this short season and even find joy in your tiny people as they cause chaos in your homeschool. 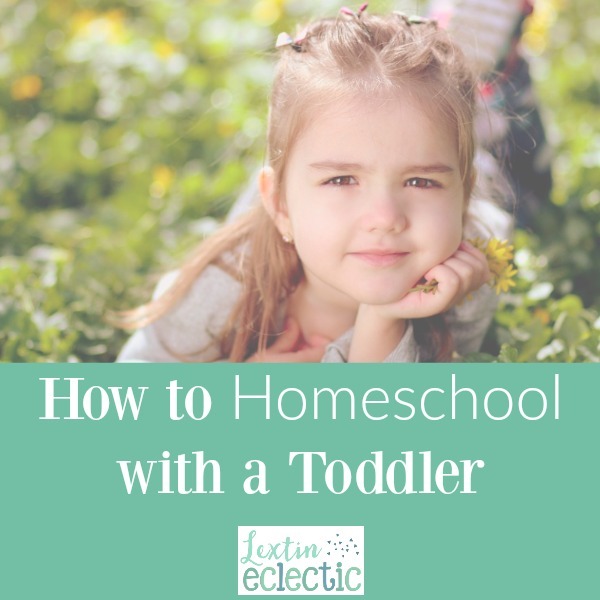 I only started to homeschool when my youngest child was 4 so I didn’t deal with all the trouble making that you probably have. We did more movies than I would have liked, but they were educational and he learned his ABC’s that way, I also planned deliberate learning times for him, I taught him blanket time, and he did room-time. It wasn’t always easy, but overall, I think we did okay. Cudos to you for homeschooling with two toddlers! Thank you! Homeschooling with toddlers is very challenging. This upcoming school year I only have one toddler so I’m hoping things are a little easier. But I think it’s very important to make time for your little people during the day. They appreciate the one-on-one time with you. And yes, room time is helpful too! This is perfect! Starting to home school my daughter this year and totally needed to read this! Thank you! Great tips, I like the routine part of how they know when special times are. I only have 1 child and it’s hard to homeschool just her lol. She’s so bouncy, but that is expected of a 3 year old. That’s a very busy age and they are hard to homeschool. But they are so fun too – they love to learn and explore. And I promise, it does get a little easier. My youngest is 4 now, so we’re past the toddler years, but I remember all too well how hectic it was! It is very, very crazy! lol And it’s definitely exhausting. One day the toddler days will be in my rear view mirror. I think I’ll miss them a little bit but I’ll enjoy my kids’ independence and the fun things we can learn together.